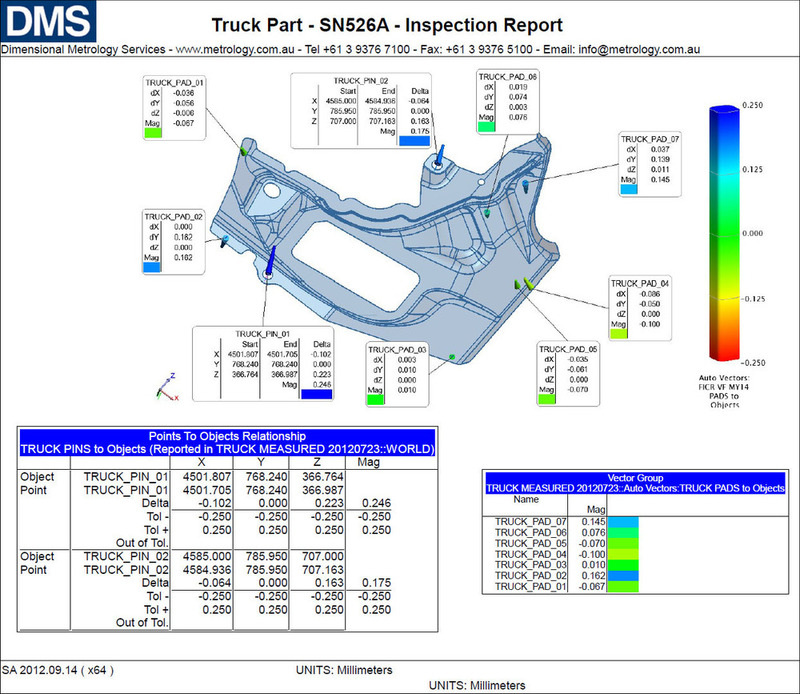 3D Inspection reports can be generated for objects ranging from small individual parts to extremely large tools, assemblies and machinery. Inspection reports are tailored to meet the customer's requirements. SpatialAnalyzer software allows us to perform complex point or cloud based inspection of parts using any one of our hardware platforms. We can inspect a part based on known Geometry (Geometry Comparison), 3D CAD Data and GD&T information. Rich graphical Reports can then be generated using all the available information, including, 3D CAD data, drawings and measurements. Objects can be measured and compared to known geometry as you would find in an engineering drawing. Reports can then be generated to include the nominal geometry, measured geometry and deviation between the two. By including tolerance information, parts can then be deemed in or out of tolerance. If 3D CAD data exists, measurements can be aligned to and compared directly to the CAD data. The inspection results can then be compiled into a rich graphical report. CAD model comparison is the method of choice when accurate 3D CAD data is available. When applicable, parts can be inspected based on geometric dimensioning and tolerancing (GD&T) information. GD&T is an essential tool for communicating design intent — to ensure parts from technical drawings have the desired form, fit, function and interchangeability. By providing uniformity in drawing specifications and interpretation, GD&T reduces guesswork throughout the manufacturing process — improving quality, lowering costs, and shortening deliveries. Software packages like CATIA can embed GD&T into the CAD. SA is able to import both the CAD and associated GD&T data, and then automatically analyse measurements based on the GD&T. In other situations, the GD&T only exists on 2D drawings. SA has the inbuilt tools to manually add the GD&T information in SA. Once the data has been analysed, graphical inspection reports can be generated in SpatialAnalyzer. These reports are tailored to the client's needs and can be as simple as a table of measurements, right through to rich graphical reports containing 3D views of the CAD data, and full analysis of the measurements.